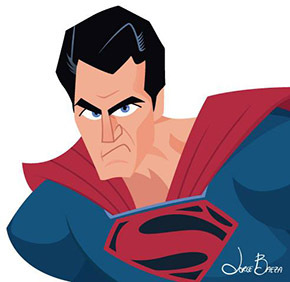 My name is Jorge Baeza and I’m a Character Designer / Illustrator. I sell comic character prints at Comic Cons and I was invited by the Topps Company to be a Sketch Card Artist for the Mars Attacks: Invasion series (2013). I have done editorial work for UK magazines such as HD Review and nationally for Geek monthly, among others. I’m an independent artist, which has given me the opportunity to do work for different brands such as Scholastic, Buffalo Games, Geek magazine among others and I was recently invited to work on Topps’ upcoming Star Wars Chrome Perspectives series. I do not represent any brand directly, but I’m always glad to be a part of something that’s as meaningful to me as Star Wars, which is the current project I’m working on. I started drawing compulsively when I was 4 years old and since my Dad was an avid reader, he’d take me to the bookstore on Sundays, which is where I was first exposed to comic books. It was love at first sight so after that, I would religiously copy characters like Donald Duck, Archie, Jughead and Superman from the pages of those treasures. I always used to dream about being somehow connected to either the comic book world or the animation industry. I think I started reading books about the comic book process since I was in High school, so it was an idea that had always been engrained in my system. I’m currently following “The Star Wars” and the New 52’s Batman ever since both series came out. I’m also enjoying Batman 66 a heck of a lot –-it may not be some people’s cup of tea but it has a lot of the elements that I love: the colorful splash pages, simple plots, retro-campiness and of course, Batman! I’d have to say Batman, for sure. Superman and Hellboy being second and third place. I love many, many comic book characters but those would be my top three. Among many others and due to my passion about cartooning and comics, I’d have to say Dan DeCarlo and Stan Goldberg (Archie comics), Genndy Tartakovsky (Samurai Jack), Mort Drucker (MAD magazine) and Bruce Timm (no reference needed). I have been very lucky that way since as a monster kid and Star Wars fanboy, I always wanted to draw Jabba the Hutt somewhere, for someone. When the opportunity to work for the Star Wars Chrome Perspectives arrived, I was excited beyond words. 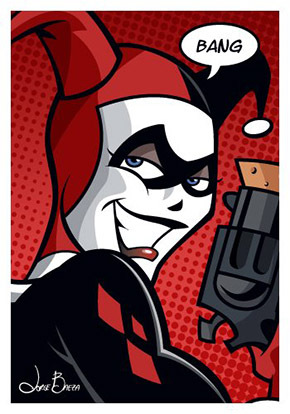 A character I’m deeply in love with and would also love to draw is Harley Quinn –she drives me crazy!. The amount of time varies depending on the complexity of the project. Some may take 2-3 hours while others may take 12, 14 or even longer to do. I like to do a lot of research … and to observe. When working on a well-known character I soak my eyes and brain in photos, movie stills, etc. to get familiar with his / her features, the way they move, act, etc. and then I do several different sketches. Once I feel comfortable with the resemblance, I work on the “tight sketch”, which I later ink or scan on the computer. After that, I apply colors and finishing touches on Illustrator or Photoshop. Ta-daa! A combination of both. I sometimes use a graphics tablet for sketching, but the majority of my work starts with pencil on paper. After that, must of what I do ends up in digital format. I use vectors a lot and Photoshop as well; just recently I was able to jump on the Manga Studio bandwagon and I’m enjoying the ride so far. Yes and yes –oh wait, that was only one question, right? –I got excited. 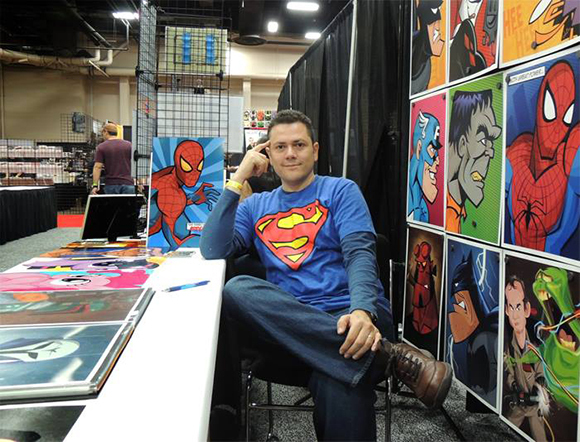 Aside from actors and actresses that one grew up watching and later meets at comic book conventions, I had the opportunity to meet Carlos D’ Anda, who was THE concept artist for the first two Arkham games and is currently working on Dark Horse’s Star Wars series. I fell in love with his work since I saw the concepts for the first Arkham game a few years back. So much so, that I did my own version of Titan Joker and sent it to him via Facebook. When I met him in San Antonio I carried a print of that illustration, showed it to him and said “I’m this guy!! 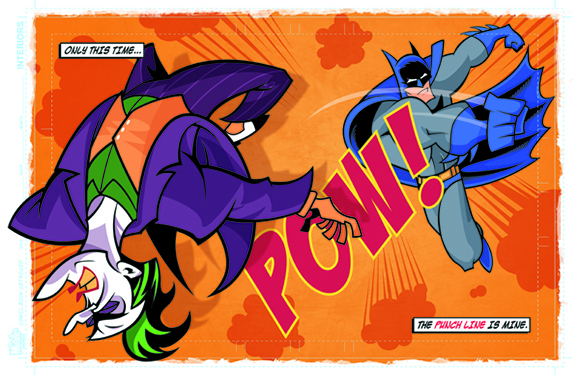 !” – since the only thing I share with that Joker is the color of my pale white skin, he understood what I meant by that. He is an awesome guy to talk to. I am not famous enough yet to have one of my characters’ sculpt but I’m sure if I were, I would have a few of them around the house. I usually tell people that my home office looks more like a 13 year-old’s bedroom than an actual office, but I guess that’s pretty much the norm in this industry. I have framed prints of Justice League, Star Wars and 80’s cartoon characters. I’m not too much of an ego maniac, so I usually have only two / three of my pieces on display. The majority of the artwork you see is made by someone else like Darwyn Cooke, Genndy Tartakovsky, etc. I do feel humbled when people have my art framed in their homes and send me pictures of it. That’s one of the most satisfying accomplishments of my work. I also have lots of toys and maquettes on display. Anything from Super Heroes to retro SciFi characters –even Jeannie and Samantha (from “Bewitched”) are there! Oh and books… lots and lots of books. I don’t think I’ve received any request that I would define as “strange” or “weird”. My style tends to be on the positive, colorful, happy-go-lucky side, so all of my commission work revolves around that. I think people that get in touch with me read me that way, so that’s what they ask for. Aside from small projects and the Star Wars sketch cards, I’m overhauling my website, which I hope will be ready by February. I have been invited to a couple of things, but I wouldn’t be able to comment on it until a contract is signed.